Darin Madson, DVM, outlines future considerations for the ever-changing virus — porcine circovirus type 2. In the growing pig, PCV2 impacts the animal’s ability to thrive, resulting in post-weaning multisystemic wasting syndrome. But the greatest risk comes in the form of secondary infections — particularly respiratory diseases that combine to produce porcine circovirus associated disease in pigs of any age, as well as reproductive failure in the breeding herd. Diarrhea and porcine dermatitis and nephropathy syndrome also can develop in infected pigs. • The virus is everywhere. If there are pigs on a site, it’s essentially guaranteed that some version of PCV2 is present at some level. • It’s an extremely hardy virus — difficult to kill with disinfectants and resistant to heat. • There is no direct treatment for PCV2, only to address secondary infections. Vaccination is the most effective tool. • The virus continuously mutates over time. Exactly when or how future mutations will occur is less clear. Today, there are four PCV2 genotypes in the United States — PCV2a, b, d and e. Globally, two additional genotypes have been identified — PCV2c and f.
Figure 1 shows a five-year snapshot of the PCV2 virus’ evolution in the United States, as illustrated by ISU VDL cases. The ISU VDL results show that PCV2d has now become the most prevalent version, accounting for 70% of genotypes sequenced, up from 30% in 2013. PCV2b peaked at 56.13% in 2013, began to decline, but has recently trended up a bit to 13.08%. PCV2a has changed the least during the past five years, remaining around 13%. Essentially all pigs in the United States are vaccinated for PCV2 today because the alternative would be devastating to their productivity and well-being. The good news is that the vaccines are highly effective, Madson points out. The key is to focus on the quality of the vaccination — that all of the pigs are vaccinated with the right dose at the right time. “If you miss pigs during vaccination or adjust the dose, it gives PCV2 an opening to replicate at a higher level,” Madson says. “Proper vaccination also diminishes shedding and the viral load in the environment, which minimizes the opportunity for mutation and helps to control the virus overall.” Of course, that’s important to the pork industry as a whole. Nearly 100% of the market hogs are vaccinated for PCV2 at a young age. Replacement gilts are vaccinated similarly, receiving a booster once they are selected or are ready to enter the sow farm. But sow re-vaccinations are less commonplace — about 10% to 20% of U.S. sows, Madson estimates. While it’s true that DNA viruses are more responsive to vaccines, because they don’t typically mutate at a high rate, it’s also true that PCV2’s ability to mutate is an exception to the rule. That means producers and veterinarians need to keep an eye on trends and genotype shifts to understand how PCV2 is changing. Today, that involves monitoring the rise in PCV2b and PCV2d prevalence and the decline in PCV2a cases. On the farm, the natural tendency is to stick with the same vaccine and immunization strategies until a problem surfaces. But there’s benefit in periodically reviewing the PCV2 vaccine program and immunization timing and procedures. Something of a hot button for Madson related to PCV2 diagnostics is the industry’s unwavering commitment to polymerase chain reaction tests. “PCR is great for viruses you’re not supposed to have, such as porcine reproductive and respiratory syndrome, but when it comes to PCV2, it’s a different story,” Madson says. While PCR allows the identification of minute amounts of a pathogen, it’s less useful with a virus such as PCV2 that’s everywhere. Mere detection of PCV2 does not necessarily correlate with disease or indicate vaccine inefficacy. For PCV2, the real question becomes, are you diagnosing infection or disease? “PCV2 infection is going to be there at some level — it just is,” Madson says. The more important action is to diagnose any associated disease, which requires checking for clinical signs and microscopic lesions and determining whether the virus is at a level that will cause problems within the herd. 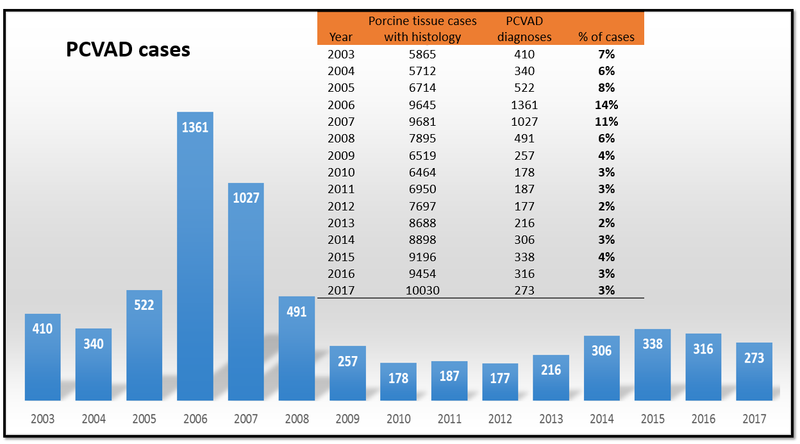 Madson points to Figure 2, illustrating that PCVAD cases peaked in 2006-07, began to decline and have held pretty steady since about 2009. Source: Darin Madson, DVM Ph.D., is a veterinary diagnostician at Iowa State University. The interview and information for this article were made possible through a coordinated effort with Pig Health Today and ISU College of Veterinary Medicine.